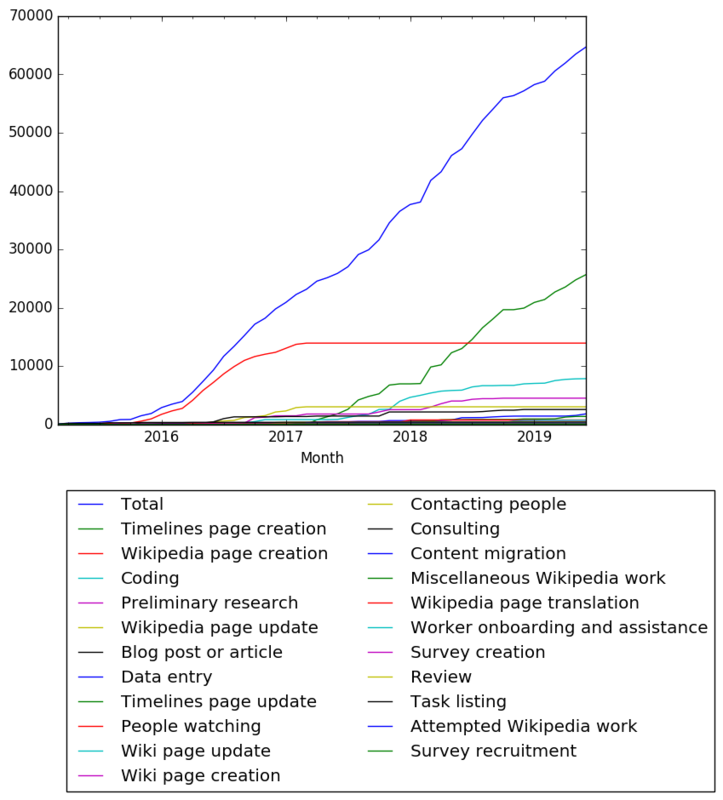 Learning subwiki Wiki page update Multiple pages (all tasks) 2018-11-29 Issa Rice 306.56 Learning Prose August: 4th; September: 10th to 20th; October: 6th to 26th; November: 2nd to 29th. $70 for the first 8 hours at $8.75/hour, and $236.56 for the next 37 hours 51 minutes at $6.25/hour. 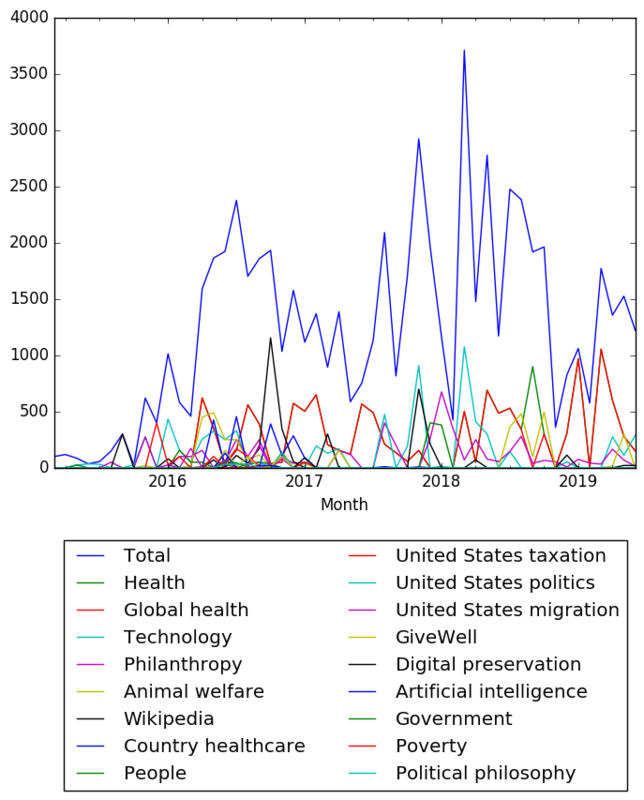 Org Watch Data entry Org Watch (all tasks) 2018-09-19 Issa Rice 68.85 Organizational structures and dynamics Code and data Work done primarily between 2018-09-13 and 2018-09-19 adding data for The Good Food Institute and Effective Altruism Foundation and making other minor edits; see https://github.com/riceissa/aiwatch/commits and check the September 2018 commits for more. Donations list website Coding Donations list website (all tasks) 2018-07-31 Issa Rice 146.00 Philanthropy Code and data Work on a bunch of issues related to importing grants databases for different donors into the donations list website. See comments made in July 2018 on http://github.com/vipulnaik/donations/issues for more information. Donations list website Coding Donations list website (all tasks) 2018-06-30 Issa Rice 55.00 Philanthropy Code and data Work on a bunch of issues related to importing grants databases for different donors into the donations list website. See comments made in June 2018 on http://github.com/vipulnaik/donations/issues for more information. Donations list website Coding Donations list website (all tasks) 2018-05-31 Issa Rice 78.00 Philanthropy Code and data Work on a bunch of issues related to importing grants databases for different donors into the donations list website. See comments made in May 2018 on http://github.com/vipulnaik/donations/issues for more information. Donations list website Coding Donations list website (all tasks) 2018-04-30 Issa Rice 250.00 Philanthropy Code and data Work on a bunch of issues related to importing grants databases for different donors into the donations list website. 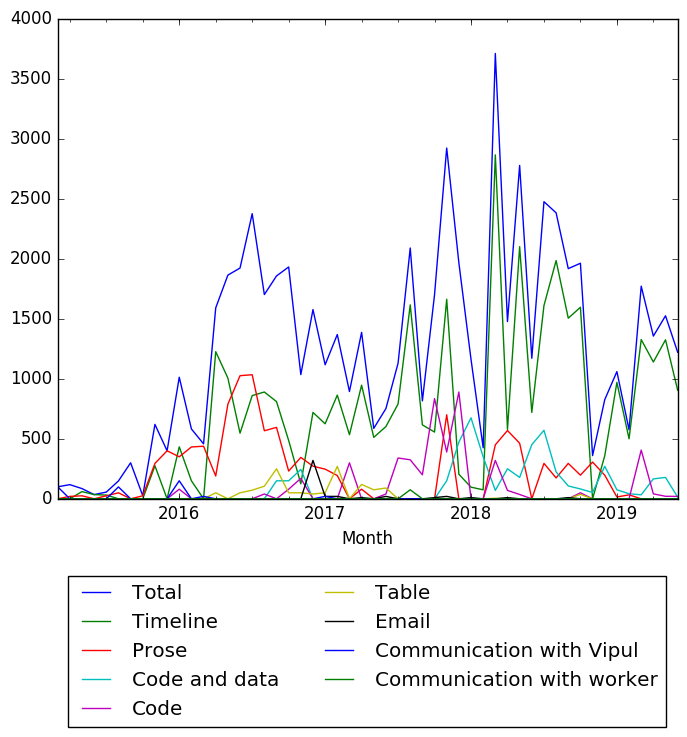 See comments made in April 2018 on http://github.com/vipulnaik/donations/issues for more information. Donations list website Coding Donations list website (all tasks) 2018-03-31 Issa Rice 70.00 Philanthropy Code and data Work on a bunch of issues related to importing grants databases for different donors into the donations list website. See comments made in March 2018 on http://github.com/vipulnaik/donations/issues for more information. Donations list website Coding Donations list website (all tasks) 2018-02-28 Issa Rice 350.00 Philanthropy Code and data Work on a bunch of issues related to importing grants databases for different donors into the donations list website. See comments made in February 2018 on http://github.com/vipulnaik/donations/issues for more information. Donations list website Coding Donations list website (all tasks) 2018-01-31 Issa Rice 675.00 Philanthropy Code and data Work on a bunch of issues related to importing grants databases for different donors into the donations list website. See comments made in January 2018 on http://github.com/vipulnaik/donations/issues for more information. Donations list website Coding Donations list website (all tasks) 2017-12-30 Issa Rice 260.00 Philanthropy Code and data Work on a bunch of issues related to importing grants databases for different donors into the donations list website. See comments made in December 2017 on http://github.com/vipulnaik/donations/issues for more information. Wikipedia Wikipedia page creation Global Programme on AIDS (Wikipedia Views) (all tasks) 2016-10-25 Daniel Alejandro Maidana 30.00 Global health/program Prose Daniel finished userspace draft but as of 2016-12-14 the article has not been cleaned and ported to main space. Cleaning and porting is on Vipul. None Preliminary research N/A (all tasks) 2016-01-18 Issa Rice 150.00 United States taxation Communication with Vipul Investigated Form 1099 filing requirements. It later turned out that Form 1099 is not required since Vipul is not operating as an organization. 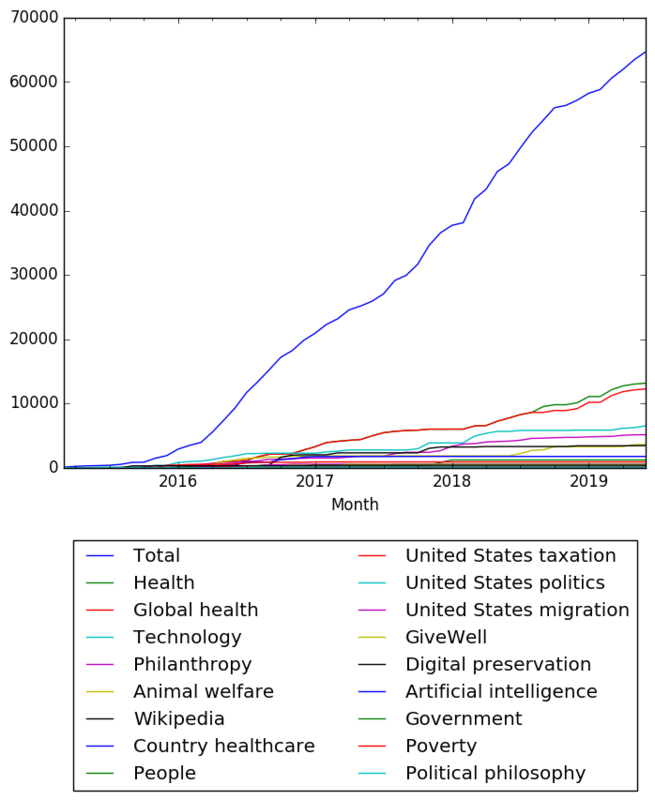 Wikipedia Wikipedia page creation Form 1040 (Wikipedia Views) (all tasks) 2015-12-31 Issa Rice 400.00 United States taxation Prose Although mostly completed by 2015-12-31, the article was published to main space on 2016-01-01. Payment, however, is considered to be for the 2015 tax year. 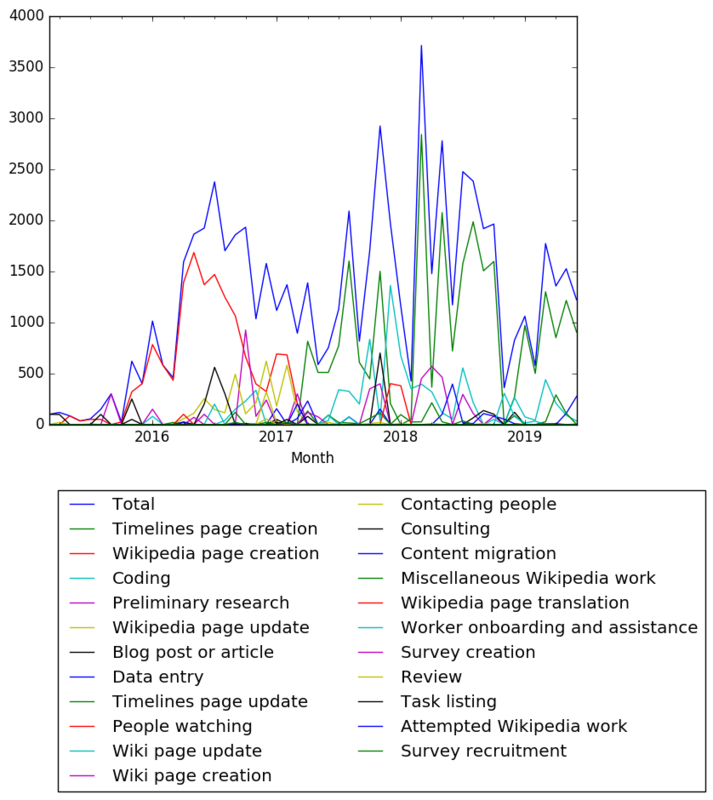 Wikipedia Wikipedia page update A Plus (aplus.com) (Wikipedia Views) (all tasks) 2015-04-05 Issa Rice 20.00 Media company Prose First Wikipedia article experience. Originally intended to create article, but it got created while this was in draft, so merged work in.